A campaign I helped create in 2017 @72&Sunny just launched recently. It’s a crafty series of progressive videos from Cheerios to help make kids more inclusive. Check out the project here or in my advertising section. Here’s a few appearances I made on TV the past week about the board game I co-created. Just launched a Kickstarter about a new game I co-created. It’s called Escape From Hell and players have to get from Williamsburg to Manhattan after the L train shuts down in 2019. This summer I was fortunate enough to direct & animate a Logo ID for the SyFy network. See more production pics here. HIKEA was featured during NYC's Design Week 2018, at the JonaldDudd exhibition in Brooklyn. Well, it's the 4th time a project I've worked on has been nominated in the "weird" category of the Webby's. 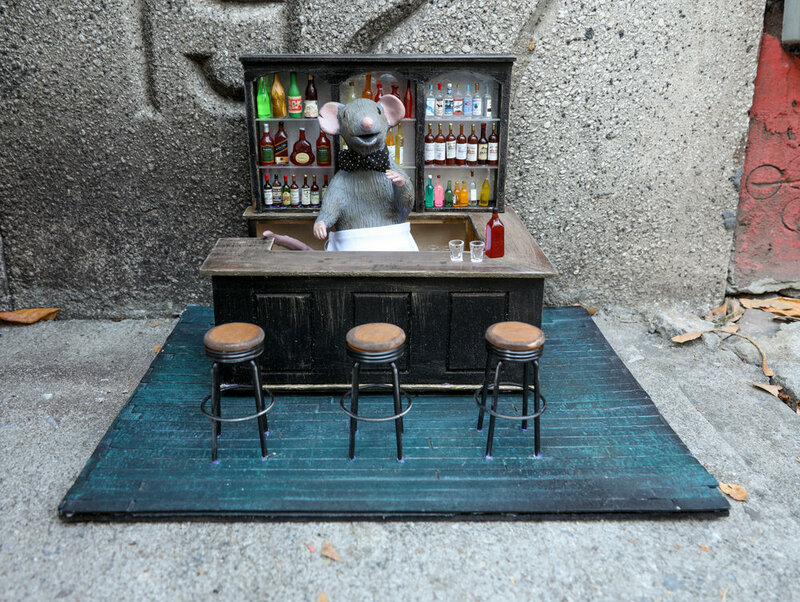 Squeakeasies, the hidden bars for rats I put around NYC, has some stiff competition from NASA and Rotten Apples in this year's show, but you know, "it's an honor just to be nominated" and such... For more info, here's a link. 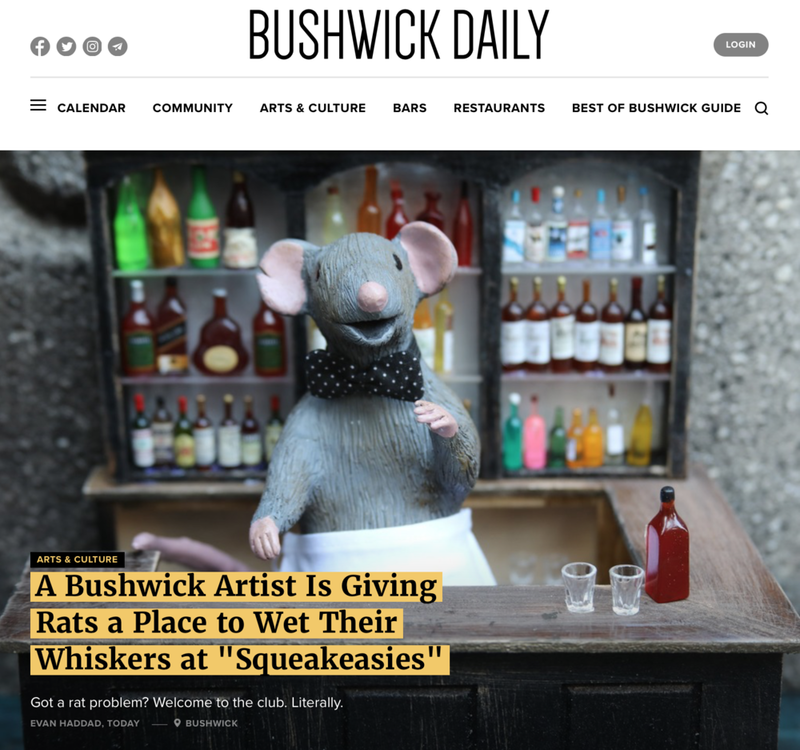 Launched my new art project, Squeakeasies: hidden bars for rats in NYC's biggest rodent-living neighborhoods. They're comically reviewed at Zagrat.com. 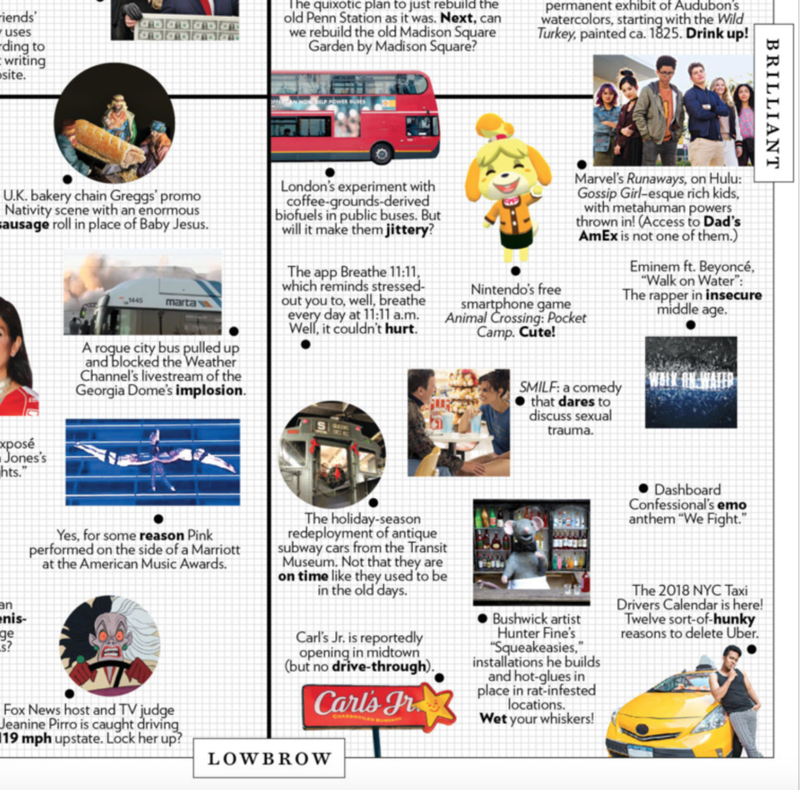 The project's been written up in the NY Post, featured on Brooklyn's News 12, and made the NY Magazine's Approval Matrix. Had a quick chat with some students at Miami Ad School recently. HIKEA was nominated for a Webby, so if you're feeling generous, please help it win by voting here: https://vote.webbyawards.com/PublicVoting#/2017/film-video/general-film/weird until April 20. A nice article about me in on a Greek Blog about an old project of mine. We hired artists to add some Coca-Cola happiness to tray tables on Delta flights. One of my projects from Wieden + Kennedy. Some press here and here. HIKEA, my latest web series, launched this month, getting a buncha press and hitting 2 million views on YouTube after a week. See the project page here, or visit gethikea.com for more. Where did the time go? Not much new to report work wise, but I've been nurturing a few side projects that will come out this summer. Here's an analog selfie I made with the help of Flipbookit for your enjoyment. They like capturing your image when you work at W+K New York. Here's some of my recent ones. Missed out on the coldness this year by absconding to San Francisco for work. Also made a small excursion to SXSW where I met a cookie hungry friend. Status Update, I'm now a professional freelancer. All your copywriting needs, or creative direction, or art direction or stop-motion animation direction. You get it. To find out my current availability, I'm also on that Working Not Working site, and my link is: http://workingnotworking.com/hunterfine. Had a pretty busy October 2014.